The first bereavement gift ideas are for people you know well, and the last five sympathy gifts are for people you may not know as well, such as coworkers. Whether your friend is a water-cooler acquaintance or a best friend, you’ll find something in this list to help you express your condolences over the loss of a mother. A beautiful work of art. 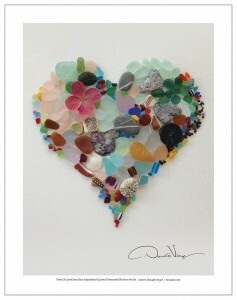 The Sea Glass Fine Art Heart Poster isn’t expensive, and it symbolizes a beautiful sentiment for someone who is bereaved after the loss of a mother. This gift is part of the The Heart Poster Collection, which is a collection of award winning photography from world famous photographer Donald Verger. His work is collected by people around the world – but that isn’t as important as how this beautiful heart poster makes viewers feel. A bereavement candle, for comfort and warmth. The Pavilion Gift Company Comfort Candle is a lovely bereavement gift, especially if you include a message about the endurance of a mother’s spirit and soul after death. The loss of a mother is one of the most difficult good-byes we ever have to say, even when we’re not close with our moms. A candle symbolizes warmth and comfort, hope and healing. The bereavement gift you choose depends in part on the relationship you have with your friend. It also depends on her personality. But, no matter how you choose to express your sympathy, remember that your presence and hugs are what count most. The more you listen and are available to your friend, the more comforted she’ll feel. A memorial stepping stone for the garden. If your bereaved friend is a gardener or just enjoys spending time in the yard, the “Those We Love Don’t Go Away” Memorial Stepping Stone is a beautiful bereavement gift idea. Engraved on it is this poem above, which is a wonderful sympathy message for the bereavement card – even if you don’t give this gift to your coworker. A holiday ornament to remember mom. Holidays are the most difficult times after the loss of a mother Yesterday I wrote an article about a girl who has Transverse Myelitis – it’s a neurological disorder that results in pain and paralysis. It’s a terrible illness, but Sarah is so upbeat and positive! She mentioned that her mother drives her to school every morning and is there for her no matter what. If Sarah lost her mother, she would be particularly grieved at Christmas and other holidays. That’s why the next two bereavement gifts for the loss of a mother are holiday ornaments. Angel and dove ornament. 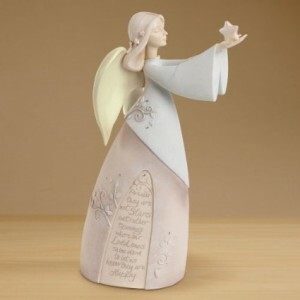 Pavilion Gift’s 9-Inch Angel Releasing Dove, with Sympathy is etched with the phrase: “Angels are always near to those grieving, to whisper to them that their loved ones are safe in the hands of God.” It’s a beautiful bereavement message for the loss of a mother, but before you give this type of gift to a friend or coworker, be sure they believe in God. Hand-painted angel figurine. The Sympathy Angel Holding Stars in the Sky is etched with the words, “Perhaps they are not Stars in the sky, but rather openings where our Loved Ones shine down to let us know they are happy.” This is a bereavement gift that may ease the loss of a mother, because it helps us believe that we aren’t alone in the universe. Encouragement to stay healthy. Research shows that the risk of a heart attack is extremely high for the bereaved in the days and weeks after losing a loved one – whether it’s the loss of a mother or a partner. The first day after a loved one died, heart attack risk was 21 times higher than normal, which declined progressively over the first month. Friends and family of a bereaved person should watch for heart attack signs and help her maintain a healthy lifestyle. This isn’t exactly a bereavement gift idea after the loss of a mother, but if you know your friend well enough, perhaps you could somehow make it one. Comfort candles. I love these beautiful Comfort Candles – Hope, Faith, Joy, and Peace, which is a six inch tall candle holder, stand and tea light candle. 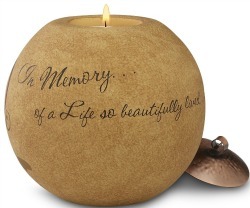 This is one of the most thoughtful bereavement gifts for coworkers because it can be displayed at home or work. I featured a differenty type of comfort candle on my article about a grandparents’ death – When Grandpa Dies – 4 Thoughtful Bereavement Gifts. A book about loss and grieving. I’ve never read Tear Soup: A Recipe for Healing After Loss by Pat Schwiebert and Chuck DeKlyen, but the reviews on Amazon on wonderful. It’s a beautiful coffee table book that others can pick up and read – it’ll help them understand what your bereaved’ family is going through. If your friend is a parent, this bereavement gift is especially powerful after the loss of a mother. A plush comfort blanket. One of my favorite gifts in 17 Gift Ideas for After Mastectomy Surgery is a soft, comforting, warm, cozy blanket. After I had surgery, all I wanted to do was curl up in a soft warm nest and sleep. Same thing after my grandma died. I think a Cozy Comfort Plus Blanket is one of the most practical bereavement gifts for coworkers you know well, because it gives them “permission” to sleep and process their grief. A cross to hold on to. This is a bereavement gift I’ve never heard of, perhaps because I’m not Catholic. I wasn’t sure I should include it on my list of bereavement gifts after the loss of a mother because you can’t give this to just anyone. But, if your bereaved friend is Catholic, this might be a great comfort after the loss of a mother. The Wonderful Clinging Cross: Handheld Comfortable Cross is designed to perfectly fit in anyone’s hand. It’s a constant reminder that God is near and real. Here’s the poem that accompanies this bereavement gift: When my mind is fuzzy And my eyes are dim with tears, I need to feel Your presence, Lord, And know that You are near. When my heart is racing And my thoughts have such a sting, I tightly grasp this little cross And prayerfully I cling. It’s not a magic piece – This cross Your father planned, But when I cling to it I feel Your nail-scarred hand. The Memorial Garden Stepping Stone includes a message of hope and remembrance. It isn’t just a bereavement gift for gardeners, it’s for anyone who has even the smallest yard or balcony. It can be hung inside or outside, which makes it a flexible gift after the loss of a mother. Bereavement gift basket. I’m a huge fan of giving gift baskets, because they (usually) keep for a long time. They can be shared with others, if your coworker doesn’t want the items in the gift basket. If you know your coworker well enough to visit at her place, you can drop the gift basket off in person – along with a nice bottle of wine. The With Sincere Sympathy Condolence Gift Basket includes a lovely bereavement card, snacks that are easy to share and eat, and free shipping. An office paperweight. This is a simple, classy, formal bereavement gift for a coworker you don’t know well, but you connect with. This Handcrafted Pewter Paperweight says “Most Things are Difficult Before They Are Easy” – which can apply to much more than the grieving process after the loss of a mother. Personally, I’d like this type of bereavement gift if I lost my mother – I like that it’s not too sentimental. More than flowers – a live plant. Flowers die, and there’s nothing worse than having to get rid of dead flowers a week or two after the funeral, memorial service or celebration of life. Instead of the traditional bouquet of funeral flowers, give your coworker a bereavement gift that will stay alive. Memory book for the service or celebration of life. This may be a bit too personal to be on the “bereavement gifts for the loss of a mother” when you don’t know the bereaved well, but it’s a practical idea. A Celebration of Life, In Memory Of… is a journal that has one page for every guest to make a note in memory of the deceased. It works for a joyous celebration of life or a somber funeral, and will help your coworker remember his or her loved one forever. If you have any thoughts on these bereavement gift ideas after the loss of a mother, please comment below. I especially welcome tips for giving gifts of comfort and peace to people who are bereaved.